Atlanta, GA–According to recent survey statistics from the American Society for Aesthetic Plastic Surgery (ASAPS), more than eight million non-surgical cosmetic procedures were performed in 2011. Non-surgical procedures have become the preferred choice for patients who do not want to undergo invasive and time-consuming surgeries. Dr. Thomas Lintner, a board-certified plastic surgeon in Atlanta, says staying up-to-date with the latest technology in the field of aesthetic plastic surgery is essential to maintaining quality patient care and ensuring the most effective results. At his practice, he implements some of the most advanced and innovative non-surgical techniques, such as a non-invasive body contouring treatment called Exilis™, which can serve as an effective alternative to liposuction or skin lifting surgery. The >body contouring treatment with Exilis™ is performed in-office and is usually completed within four to six visits. The Exilis™ laser operates in a similar manner as an ultrasound: a gel is applied to the skin while the surgeon uses the Exilis applicator to target and disrupt the structure of fat cells. The body’s natural cleansing process then flushes out fat through the liver and kidneys, which can result in tighter skin and a smoother appearance. 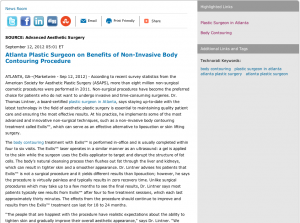 Dr. Lintner advises his patients that Exilis™ is not a surgical procedure and it yields different results than liposuction; however, he says the procedure is virtually painless and typically results in zero recovery time. Unlike surgical procedures which may take up to a few months to see the final results, Dr. Lintner says most patients typically see results from Exilis™ after four to five treatment sessions, which each last approximately thirty minutes. The effects from the procedure should continue to improve and results from the Exilis™ treatment can last for 18 to 24 months. Dr. Lintner says his goal as an Atlanta plastic surgeon is to provide the safest, most cost-effective treatment options for his patients. He says he believes in the importance of taking the time to review treatment options with patients to achieve the results that will best suit their individual needs.Whether he is performing breast augmentation or a non-surgical liposuction alternative, he says he relies on skills and expertise to the fullest, which is why Dr. Lintner stresses the importance of consulting with a board-certified surgeon before any procedure is performed. Dr. Thomas Lintner graduated with honors from Georgetown University and received his medical degree from Emory University School of Medicine. He is a member of a number of professional organizations such as the American Society of Plastic Surgeons, American Society for Aesthetic Plastic Surgery, Georgia Society of Plastic Surgeons and the Medical Association of Georgia. Dr. Lintner has given presentations covering specialties such as general and plastic surgery, and he has been published in national journals of medicine and surgery.